Do you know the common budgeting problems that people usually encounter? It can be beneficial for you to know what they are. Sometimes, people mistakenly think that budgeting is very hard. It is probably why reports reveal that only 30% are able to use budgeting to create a financial plan for the future. What they do not know is that they have been committing mistakes that are making budgeting more challenging than it has to. If they can correct these mistakes, it might make their budgeting efforts less stressful. The truth is, budgeting takes a lot of getting used to at first. Not only that, it can be a bit tedious in the beginning. After all, you need to meticulously observe and take note of your expenses. This is the only way you can create a realistic budget plan. While having a realistic budget plan is a step in the right direction, it is not enough. In the beginning, it might come easy for you. However, over time, it might prove to more challenging to follow. If this is the case, you need to check if you are committing one of the common budgeting problems. 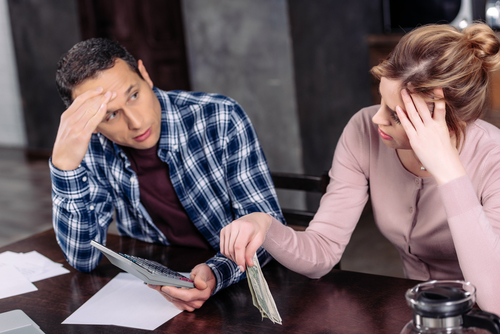 So what are the problems that are compromising your budgeting efforts? Here are the most common of them all. You are probably wondering what this means. When you think about your monthly expenses, you will realize that there are weeks that are filled with bills and payments while there are weeks without a single payment. One of the benefits of having a budget plan is making sure that you will have a consistent cash flow during all these weeks. It means being prepared for the weeks when you need to pay a lot of bills. It also means controlling your spending habits during the weeks when you are not obligated to pay bills. So if you notice that you are running out of money during certain parts of the month, that means there is something wrong with your budget plan. What you need to do is to anticipate the “expensive” weeks and make sure the “cheaper” weeks before it will be used to prepare for it. For instance, if most of your bills come it at the end of the month, you need to make sure you save up for it when the month begins. That way, the paycheck that you will receive will be given a boost by the income you got at the start of the month. Through your budget plan, you can be assured that you will have enough money any time of the month. It is one thing to have some cash flow issues. It is another to have your finances fall short. According to statistics, 8 out of 10 Americans live from paycheck to paycheck. This means their income is just right for their expenses or it is falling short at the end of the month. These are the people who always cannot wait to get their next paycheck. A few days before the next one, they are already out of cash. If this is your reality, you need to take a look at your budget. When you are running out of money, that means your budget plan is not doing its job properly. To fix this, you need to scrutinize your expenses. Make sure your money going where you want it to. List all your expenses and rank them according to priority. Think about cutting back on the expenses at the bottom of your list. This is one of the scary yet common budgeting problems. When you find yourself running out of money, it can easily be fixed by eliminating the unnecessary expenses. However, with the inflation rates rising faster than the wage growth, it is not impossible for your expenses to eventually exceed your income. It may have been just right when you started your budget plan but it may no longer be enough in the near future. Obviously, you have to update your budget plan. But if there is none that you can cut back on your expenses list, look at your debts. You might be able to negotiate a lower monthly payment. That way, you can lower your overall expenses without having to get in trouble with your monthly obligations. If it is not enough, you may have to downsize your lifestyle. Let us assume that there is no problem in your budget plan and you know that your income can cover your expenses. Why is it still not working? How come your income still runs out at the end of the month? Well, you may want to look into the behavior of the people in your household. If nobody is following your budget plan, it is also bound to fail. When it comes to your household budget, it should be a team effort. You cannot do it on your own. You have to make sure everyone is making an effort to implement it in their respective financial transactions. If you find your partner, spouse or other members of the family refusing to follow the budget plan, you need to sit down and talk to everyone involved. You need to make them understand why this is important. They have to follow it if you all want to reach your financial goals. Common budgeting problems, while they can be financially destructive, are not that hard to overcome. You just have to change the wrong habits and behavior that led to the downfall of your current budget plan. If you want to live better, you need to continue tracking your expenses and saving your money. A functional budget plan can help you accomplish that. To help make your budgeting effective, here are some tips that you need to do. Start by making sure that it is always updated. Even if you created the perfect budget plan, it will still require changing every so often. In order for your budget plan to be effective, it has to be aligned with your current lifestyle. Since your lifestyle preferences change as you grow as a person, it only goes to follow that your budget should do the same. For instance, your food budget might change as you start a new diet for health reasons. Once you decide to have kids, your budget will change as well. You have to make sure your budget plans will change according to what goes on in your life. The reason why you need to update your budget plan all the time is so it remains realistic. If not, you will most likely encounter one or more of the common budgeting problems mentioned earlier. By realistic, it simply means you need to be honest with both your income and expenses. Some people attempt to reach their saving goals by restricting important expenses. Since these are necessities, they end up overspending. This is never a good thing because it will make your budget fail. The intention to save is good but do not make yourself miserable doing it. Keep everything realistic so you can still live a comfortable life despite your budgeting efforts. An updated and realistic budget plan is nothing if you cannot follow it. You cannot manage your finances wisely. You will also find it hard to live a debt-free lifestyle. These are only a few of the things that you will benefit from if you follow your budget. It is usually the first step in improving your financial position. It does not matter if you have a low-income or you have it in abundance. You will always need a budget and you need to make sure it is implemented in your life.